Listen to all of your favourite music all over your home, inside or outdoors. Use your iPhone, iPad or Android device to choose songs and adjust volume in any room. Integrate your music collection from all your phones, computers and Internet radio into one giant music library. Control your home hifi system from the palm of your hand, a stereo system for your whole home. We sell the excellent SONOS and Nuvo music systems. We've worked with both music systems here in Thailand for over a decade and are Thailand's most experienced multi room audio installer. We install in Phuket, Chiangmai, Hua Hin and Bangkok. We also distribute the great sounding range of ROTH Speakers with a range of wall mounted, bookshelf or floorstanding models with audiophile quality sound. Scroll down to read about Sonos, Nuvo and Roth, Scroll further to learn about the audio design process, some of our previous successful distributed audio installs and our Home Audio FAQ. If you have a Hotel, Bar or Restaurant then we've got you covered as well. We've provided great sound systems for the smallest of intimate bars and restaurants up to the biggest and best in nightclubs. Whatever we do it will sound great, work effortlessly for years and be backed by our expert support and knowledge. Ben & his team did a quality installation at our villa. This included a complete end-to-end audio-video design, and installation of a multi-zone Sonos system, built-in speakers, and XBMC/KODI media center system. The initial install was done perfectly. There has been a Sonos system expansion, as well as consultation regarding updates. Always a pleasure working with H3 Digital. This time around it was for a turn key solution for the delivery and installation of sound system in the ‘Cachet Pool Club’ at Cachet Resort Dewa Phuket. Sonos took both the audiophile and multi room audio industry by storm when it was released in 2005, and again when they launched the Play series of smart wireless speakers. Sonos works by creating a mesh network (SonosNet) for the audio components, with each individual Sonos amplifier or speaker able to talk to any other component, so it works really well regardless of your home wifi network. Sonos home audio systems make it easy for everyone to listen the music they love in every room of their home (and outdoors). Because it's so easy to use it lets you spend time discovering and listening to new music whilst appreciating the best sound quality. Sonos products can be updated online, adding new functionality, recently Apple Music, Spotify, Rhapsody etc... and soon Alexa voice control. Yes, That's Amazon's Alexa - Get ready to voice control your Sonos...Soon. The original pioneer of multi room audio, Nuvo introduced the first distributed music system 20 years ago and have been forefront in architectural music systems ever since. Nuvo whole home audio systems guarantee a great listening experience, choose a wired or wireless music system that's easy to listen to. Nuvo supports 24 bit FLAC at up to 96Khz, what does that mean? Well that's HD Audio so it means your home hifi is going to sound great. Control it from your iPhone, iPad, Android device or Tablet. Play different music in different rooms or the same music throughout the house. The range is topped off with some of the best sounding in-ceiling, outdoor and rock speakers in the industry. If you care about great sound Nuvo speakers are a great addition. Roth Audio are the 5 Star Speakers that What HiFi called "The Real Deal" whilst lauding "impressive detail and dynamics" and stating they impress with their "weight and authority". 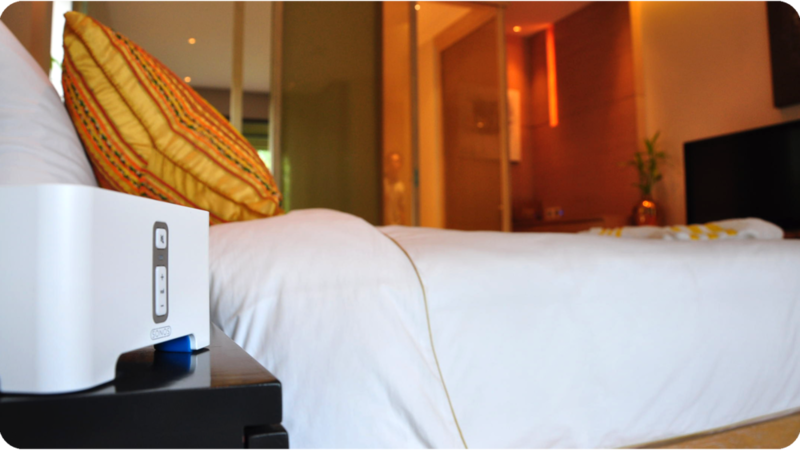 Praised for their great sound and good looks, Roth Speakers are distributed in Thailand by us. They can be used in stereo, hifi or distributed audio projects, as bookshelf speakers or mounted to walls either in stereo configuration or as surround sound speakers. We've also had a lot of fun with using them in home cinema as surround, front and centre speakers. Roth speakers are ideal for critical listening, the smaller RA1 model suit listening to music in the bedroom or placing next to the TV. The bigger RA2's are more conventional bookshelf speakers and the RA3 and RA4 are floorstanding speakers with oodles of tight, controlled Bass. Designing an audio system for a home starts out with the customer, we listen and understand how and where you want to listen to music, what music you listen to. At each step we bring expertise, professionalism, and attention to detail - it is during the Design stage that our hard work points towards a successful project. We meet with you or your representatives and understand what you would like from a home audio system. Wherever you want your music, good design will get the most out of your music system. Which rooms or areas would you like to listen to music. We sell Sonos, Nuvo for multi room and Reference:Audio for standalone. If you are going to party, let us know and we can specify higher grade, larger and more powerful components. MP3's, Spotify, Pandora, iTunes... Let us know and we will make sure all your media works. We design and install multi room audio systems throughout Thailand some of our main markets are apartments, condos and houses in; Phuket, Hua Hin, Bangkok and Chiang Mai. Below are some previous distributed multi room audio system that we've installed here in Thailand. We are the Thai distributor for Nuvo and Sonos we have over a decade of experience installing. I have worked with H3 Digital - Ben and Rob for the past 10 years. They installed a world class Sonos sound system in my apartment in Phuket. Their expertise, friendly approach and importantly their commitment to great after sales service has encouraged me to request their assistance once again; in my new villa in Chiang Mai. This villa on the south coast of Phuket features 14 zones of audio and includes an underwater swimming pool speaker. 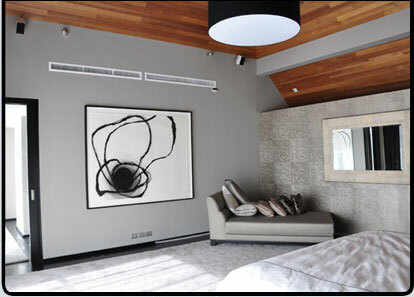 We used the Nuvo Grand Concerto system and Nuvo In-Ceiling and outdoor speakers to provide superior audio throughout all bedrooms, common areas, kitchen, dining room and pool terraces. This stunning house has set on Layan Beach has Sonos audio throughout, using Sonos Connect:amp with in-ceiling and outdoor speakers. The Lounge (pictured) first was so big that we used two 12" Subwoofers to give the music more depth, it's a very entertaining, great for parties and having fun. This beautiful villa has a Sonos system throughout with an emphasis placed on common areas and outdoor entertainment. This system is equally happy playing loud at Parties and events as it is to run background music to chill out and relax to. Multiple pairs of outdoor speakers and an outdoor subwoofer means that parties by the pool are really fun. Set in the luxury Trisara development this home features Sonos Audio in all rooms and multiple outdoor areas. The master and each guest bedroom have individual Sonos zones for bedroom, bathroom and terrace areas - so that the owner and his guests are able to tailor their musical experience themselves. The house really comes alive when they are all turned on in Party mode. 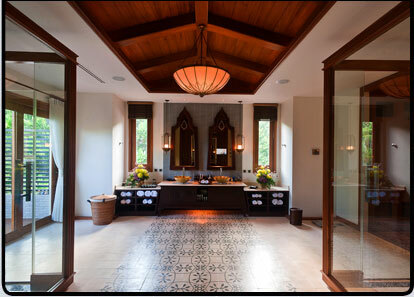 We have completed Sonos and Nuvo sound systems for around half of the residents at Layan Hills in Phuket, installs consisted of Sonos or Nuvo amps linked to in-ceiling, in-wall and outdoor speakers. One customer has an underwater pool speaker that he routinely plays whale noises on, his guests love it. This villa had the full H3 treatment, it got Sonos in every room with emphasis on the outdoor pool terrace area for music. It also featured a KNX lighting system, the owner was so happy we were invited back to build a full home cinema in an empty space underneath the swimming pool. Around half of the villas in this luxury estate above Bangtao beach feature Sonos sound systems from H3 Digital. 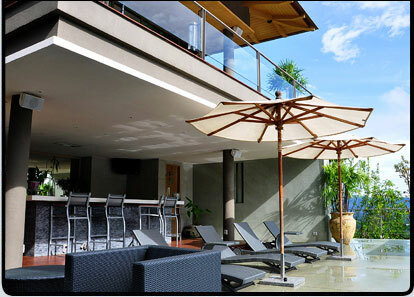 Living areas and outdoor areas are given special attention, the pool terrace and all external areas sound great. Indoors, all of the common areas and bedroomss feature Sonos Connect:amp with Nuvo-in-ceiling speakers. What does Multi Room or Distributed Audio mean? These terms refer to sound systems for your home that let you play your music in different areas (zones) of your house, villa or apartment - either different music in each room or Party Mode where many or all zones play the same music at the same time (but perhaps at different volumes). Typically with your smartphone (iPhone, Android) or tablet (iPad, Android) - you can choose rooms, choose your music (artist, album, playlist or radio station) and adjust volume for any room in the house from the palm of your hand. Where do the speakers go? Architectural speakers are used, these are either in-ceiling speakers or in-wall speakers that sit flush to the surface, making them almost invisible with no wires visible but producing incredible sound quality. When people talk about Wireless Audio or Wireless Music Systems they are generally talking about the ability to control it wirelessly through your phone/tablet or Wireless Speakers like the Play1, Play3 or Play5 from Sonos that only need to be plugged into the power socket. All of our systems need plugging into a power source. Yes, the music quality will be fantastic - because it's digital there are no hisses, pops or crackles just crystal clear music to your ears. Where can I have my music? Anywhere, any room (either in-ceiling or in-wall speakers, any outdoor space (weatherproof and rock speakers) even underwater (Our range of underwater speakers is used by the Navy Seals to train dolphins). Every room is unique and everything in the space will change the way it sounds. We work with you to make sure every area sounds great, speaker positioning is critical and we plan accordingly. Will I see Speaker Wire? No, speaker wire is hidden in conduits in wall and above the ceiling, no speaker wire will be visible on your install. Yes, definitely - When music is so easy to turn on and off, so simple to listen to the latest albums, you will find you listen to music and enjoy it so much more.